This is the absolute best grade of Lu An Gua Pian from Anhui Luan Guapian Tea Industry, one of the China's Top 100 Tea Factory and widely regarded as the best Lu An Gua Pian tea producer in the country. Lu An Gua Pian tea is a very old tea with history dating back to the Ming Dynasty (1368-1644). It had always been a famous in China even in ancient times, where it was highly praised by scholars and people in the Imperial family. History records suggest that Empress Dowager Cixi (Qing Dynasty) was extremely fond of this tea, consuming almost 14 liang (~700 grams) every month. Gua Pian tea was also mentioned repeatedly (80 times!) in the renowned Chinese Novel - "Dream of Red Mansion". It was selected as the National Gift Tea to the United States Secretary of State during his visit in 1971 when People's Republic of China was just established. Cha Wang grade Gua Pian tea leaves are harvested only from organic farms in high mountainous areas that are above 600 meters above sea level. This tea is categorized as "Tian" (Heaven) Grade by the company, representing the highest grade. Below it are "Di" (Earth/2nd grade) and Shan (Mountain/3rd grade). Cha Wang Lu An Gua Pian is certified organic by Zhong Xing Product Certification Company. Cha Wang Lu An Gua Pian has sweet nutty aroma and taste. The aftertaste is also apparent, which is rare in green teas. It is absolutely delicious and very refreshing. The tea is also easy to brew; will not go bitter even when over steeped. 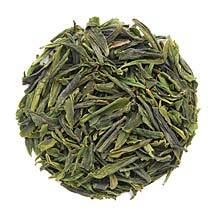 The dried tea leaves are dark emerald in color, but turn fresh green color once infused. Round, single leaf shape resembles melon seed.